If you have a love for gardening we’re sure you’re always looking for something to do outside. We have created a Monthly Garden To-Do List to help you keep up with the maintenance and projects that should be done throughout the year. Our list was written specifically for USDA Zones 7b and 8a. The calendar may say winter, but there is still plenty to do to keep you outside in the garden. Get ahead of the game, prevent insects and fungus now! January and February are the perfect time to treat your plants for insects and fungus. While you may not see pesky insects on your plants, the eggs are there waiting to hatch in the Spring. Your roses and crape myrtles may have dropped their leaves, but the spores of black spot fungus or powdery mildew are just waiting for warm weather so they can attack your plant.Furthermore, the insect called “scale” multiplies in the winter. If you see little white specks on the stems or leaves of your plants, pick a nice winter day and get outside and give them a good shower with an oil-based spray.Oil-based sprays are “organic” in that they smother the insect, its egg or the disease without using a toxic chemical. 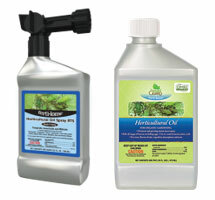 Spray any plant in your landscape that tends to be attacked by insects or fungus. Do-It-Yourself Lawn Care Program – Time to Renew! If you are interested in learning how to care for your lawn and be the envy of your neighbors, now is the time to hop on board with our Easy Four Step Lawn Care Program. Punxsutawney Phil lives far away from South Carolina so don’t wait for the groundhog to tell you spring is on its way! Take this time to shake the winter blues off and head out to the garden for some pre-spring clean-up. It’s time for STEP #1 of the Lawn Care Program – Step 1 is applied between February 15 and March 15. Wait until the daytime high temperature is above 65 degrees for four days in a row before you apply. March 15th is the latest you should apply STEP 1. Cut ornamental grasses, such as Miscanthus, Pampas, or Muhly Grass, back to 6-12 inches. Prune your roses. Shrub roses, such as Knockouts, can be cut back to 2 feet tall and wide. Rake up the leaves you ignored in the Fall and apply fresh pine straw or other mulch. Prune Spring flowering shrubs after they bloom (Forsythia, Loropetalum). Prune peach and plum trees, apples and pears if necessary. Prune tree branches that cross or rub other branches. Use Horticulture Oil Spray on any plant that tends to get insect or fungus problems in the Spring/Summer… Gardenias, Azaleas, Magnolias, Palms, Crape Myrtles, Indian Hawthorne, Roses, etc . Clear extra leaves and pine straw around emerging bulbs to allow them to grow. Are you itching to get out in the garden? Will March come in like a lamb and go out like a lion? It’s always hard to tell here in the Midlands. In some places throughout the county, we still have to worry about a late frost so watch the skies and keep tuned to your weather forecasts if you put out those tender vegetable plants. Prune winter and spring flowering trees after blooming and before the buds form for next year. Apply Fertilome 2-in-1 Systemic to protect plants from insects and fungus for six weeks. Or, for insect control only, apply Fertilome Systemic Insect Drench, which protects plants from insects for one year. Spray apple and pear trees with Fertilome Fire Blight Spray. Leave foliage of daffodils until it turns brown to provide a food reserve for next year’s flowers. Wash crape myrtle limbs, which are covered with black sooty mold, with mild soap and warm water. Spray with Fertilome Horticultural Oil (if the temperature is below 85 degrees) to prevent re-occurrence this year. Attack wood borers. These pesky insects are lethal to ornamental trees. They are particularly fond of dogwoods, ornamental cherries, redbuds and purple leaf plums. We no longer recommend systemic insecticide because the wood borer is now immune to it. It now requires a chemical called Pyrethrins (organic because it comes from the Chrysanthemum flower), which must come in contact with the wood borer in order to kill it. This chemical is found in a product we carry, called Fertilome Triple Action. Don’t wait until you see wood borer damage, because then it will be too late. Spray it right on the trunk of the tree (from the ground up to about 5-6′) about once a week from late March to mid-May, in hopes of catching these pesky insects in the act. DO NOT fertilize your lawn until the grass has “greened up” and you have mowed it twice. DO NOT prune spring blooming plants, such as azaleas, which have yet to bloom. Spring is in full swing, and it’s time to get out in your garden and work those muscles that have been asleep all winter long. Apply fertilizer and weed killer to your lawn, after you have mowed your grass twice. This is Step 2 in our DIY Lawn Care Program. Fertilize trees and shrubs if you haven’t already. 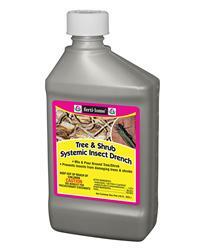 Apply Fertilome Tree and Shrub Systemic Insect Drench to plants in your landscape that typically have insect problems. Spray ornamental cherry trees, Japanese maples, dogwoods and magnolias with Fertilome Triple Action. Spray trunk, limbs and foliage from the ground up to six feet. These trees are most susceptible in the month of April to wood borers, which will kill the tree. Triple Action contains Pyrethrins, which is the only chemical that is currently available to protect against wood borers. Clean debris from plants and apply fresh mulch to landscape beds. Plant now, before the really hot weather sets in. When you plant, use Natural Guard Plant Starter Food to stimulate root growth. It contains mycorrhizae, which are fungi that handle underground nutrition-gathering and protect the roots. Get your vegetables planted by the end of the month! May is our favorite month here at Wingard’s! The roses are blooming, we’re eating fresh lettuce and peas from our garden, and the pests and diseases are still at bay. It’s the perfect month to spend as much time as possible enjoying your garden. 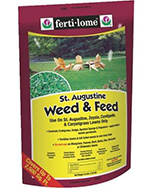 Apply “weed and feed” to your lawn, if you haven’t done so yet. This is Step 2 in our DIY Lawn Care Program. 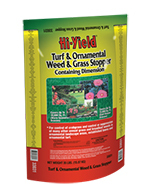 Apply HiYield Bug Blaster II to your lawn to control unwanted insects. Works on Fire Ants, Fleas, Ticks, Mole Crickets, Chinch Bugs, European Crane Flies, Scorpions and other listed insect pests. Apply Fertilome Yield Booster to your tomato plants to prevent “blossom end rot.” This common malady of tomato plants is caused by calcium deficiencies and irregular watering. It can be recognized by the dark gray/ black sunken area on the blossom end (bottom of tomatoes). Blossom end rot can be small or can cover almost half of the fruit and will decrease tomato yield. Spray this product on the leaves, blossoms and fruit. Fertilize trees and shrubs, if you haven’t already done so this Spring. Healthy, appropriately-fertilized and watered plants will resist diseases and insect infestations. 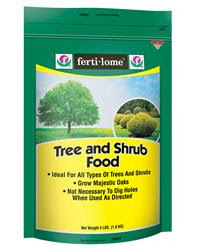 We recommend Fertilome Tree & Shrub Food. Do not use fertilizer “spikes”. They concentrate the fertilizer in one spot and can burn the roots of your plant. Prune azaleas and other spring-flowering shrubs after they have finished flowering. Fertilize perennials and annuals. We recommend adding Fertilome Blooming and Rooting Soluble Plant Food (9-58-8) if your flowers are not blooming adequately. The middle number in a fertilizer description indicates the concentration of Phosphate (or phosphorus) in the product. Phosphate is the ingredient that helps to promote bloom. Deadhead perennials, annuals, roses. The mission of a plant is to reproduce (you know, survival of the species). If you leave the dead flowers on the stems, the natural next step for the plant is to generate the seed. If you take off the dead flowers, seeds don’t form, and the plant must generate more blooms in order to reproduce. Your garden is all planted by now, and you should be seeing the fruits of your labor in both beautiful blooms and fresh produce. Even so, there’s always something to be done, whether it’s pruning, tidying or deadheading. Do Step 3 in Wingard’s DIY Lawn Maintenance Program. This involves fertilizing your lawn. For St. Augustine Grass, the fertilizer should be applied in June. For all other grasses, do it in July. WATER, WATER, WATER. Just like you, plants need water to live and to thrive. Arrange for someone to water your plants while you are on vacation. We have “tree gators” for trees and “plant nannies” for containers. Prevent Blossom End Rot on Your Tomatoes – Keep the soil of your tomato plants consistently moist. They don’t like vacillating between very wet and very dry. You may also spray the plants with Fertilome Yield Booster to help prevent this common problem. Combat Slugs & Snails without Harming Pets – Espoma Earth-tone Slug & Snail Control. It is certified as an organic gardening product and is safe to use around pets. Get ahead of Japanese Beetles for Next Year – Apply Hi-Yield Grub Free Zone to your lawn during the summer to kill the grubs and help prevent the beetles from invading next year. It’s the dog days of summer and here in the Midlands that means it’s HOT! Everything in your garden slows down and generally starts to show signs of stress from now until mid-August. Try and stay cool which means all gardening tasks should be done in the early morning or at dusk when things start to cool down for the day. Apply Step 3 Lawn Care for Centipede, Zoysia, and Bermuda grasses. Eliminate fire ants in the garden with Ferti-lome. Come and Get It fire ant bait. Kills the queen; kills the mound; safe for vegetable gardens. Tired of Fire Ants? Learn how to get rid of them with a One-Two Step Punch Method! Eliminate insects and fungus with Ferti-lome Triple Action Plus. The long summer season in the South gives us plenty of time to enjoy the rewards of our hard work in the garden. Unfortunately, it also provides the perfect environment for insects and fungus to thrive. Take action before too much damage is done. Maintain mulch to control weeds and help retain moisture. Keep newly planted trees and shrubs watered. When the temperature exceeds 100º F, you may need to water twice a day, especially for 15 gal and larger plants. SLOW and DEEP are the key words for watering during extremely hot and dry periods. Fertilize and “deadhead” annuals and perennials to keep them blooming until frost. Use a fertilizer with a high middle number such as Ferti-lome Premium Bedding Plant Food (7-22-8) or Ferti-lome Blooming and Rooting Soluble Plant Food (9-58-8). If your plants have stopped blooming, it may be because of the heat. Cut them back and let them rest awhile. As soon as the weather cools off a bit, they’ll reward you with a new show of blooms. Spot treat weeds and grass growing where you DON’t want it to grow. Make sure you are watering your plants adequately. A good soaking twice a week is better than a small daily dose of water. Irrigation designed for your lawn is not enough for shrubs and trees, especially ones planted within the past year. Plant your Fall garden so you can harvest broccoli, cauliflower. cabbage and lettuce in a few months. 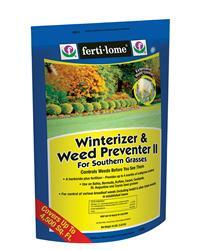 Fertilize your shrubs and trees with Fertilome Tree and Shrub Food 19-8-10 if you haven’t done so this year. This is the last month we recommend fertilizing before Spring. But if you have shrubs that are stressed due to lack of water, don’t fertilize them…. just make sure they are getting well-hydrated. Fertilizing a dried out plant in hot weather could burn it even more. Prune trees and shrubs, if needed, but don’t prune azaleas or hydrangeas. Cut back perennials and annuals to generate a flush of new growth and blooms in September. Also, now is the time to put Tree Tanglefoot on pecan trees to prevent pecan weevils. Tree Tanglefoot provides the perfect solution to protecting your valuable trees and reducing future pest populations. As the insects climb up over the sticky barrier, they become trapped without escape. Best of all, the action is strictly mechanical – NO pesticides or harmful chemicals are involved. Typically the heat will not break until late September in the Midlands. The colors in a September garden are just breathtaking. What began to show some stress last month is starting to perk back up with the cooler nights. It’s time to stand back and reap all you’ve sown during spring and summer. Plan your October planting projects since October is the best time of the year to plant! Prepare the soil, kill the weeds, make new beds, fix the drainage, put in hardscape. Be ready to plant when the weather cools! Put pre-emergent on your lawn to prevent winter weeds. Plant cool-weather vegetables if you haven’t already. Do it early. You’re running out of time! Do NOT fertilize or prune shrubs. You may “clean up” a plant, cutting out dead branches, etc. But don’t do a heavy pruning. You can divide perennials now or wait until October. Clean up (cut back) leggy annuals and perennials in order to get another flush of color when the temperatures cool. Check all your plants for insects infestations or diseases that may have developed over the summer and treat accordingly. Early October is still showing us plenty of blooms on our favorite summer plants. Most likely you are enjoying the last of the garden tomatoes and are starting to pick pumpkins and gourds for your holiday décor’. Our to-do lists are getting shorter, but there is still plenty to do to keep you busy in the garden. Collect fallen leaves to start a compost pile. Plant trees and shrubs! Best time of year! Roots have time to establish before the plant becomes dormant in the winter. Less watering is required. Lower likelihood of transplant shock. Divide daylilies, hosta, agapanthus, grasses, amaryllis, iris, elephant, daffodils. If you want to winter-over tropicals, such as hibiscus, move them inside before the first freeze/frost. Plant spring flowering bulbs. Our climate is not suitable for tulips. Crocus, daffodils, and hyacinths do much better. Plant pansies, snapdragons, ornamental cabbages and kale now! Dig and store caladium bulbs. With the end of Daylight Savings Time, you may find your gardening time limited to weekends and daytime. Take advantage of the mild temperatures to plant spring bulbs and keep the leaves off your lawn. Keep the leaves and pine straw off your lawn, by either raking or mowing. A layer of matted leaves will be sure to kill your grass. Clean fallen leaves out of shrubbery beds and add to compost pile. Plant trees and shrubs! It is still a great time to plant. Divide daylilies, hosta, agapanthus, grasses, amaryllis, iris, elephant ears, daffodils. Plant pansies, ornamental cabbages, kale and snapdragons, now! Cut back foliage of perennials as plants go dormant. We recommend NOT cutting back lantana, as exposed limbs can absorb moisture and freeze the entire plant. Wait until new growth appears to cut back the dead limbs of your lantana. Do NOT cut back your hydrangeas as they lose their leaves. Wait until new growth appears in the Spring, then trim dead limbs. Bring your “house plants” indoors yet and they’re still alive, now is the time. Be sure to spray for insects before bringing them into the house. Even if you don’t see signs of insects, there are probably insect eggs on plants that have been living outdoors, and they will infest your house pretty soon. Clean out nesting material from birdhouses. Chop up those Halloween pumpkins and put them in the compost pile. In the Midlands, we can still expect some warmer autumn like days in December. Take a much-needed break from your garden and enjoy the holidays with your family and friends. If you must be in the garden use this time for some late-fall clean-up. On warmer days, clean fallen leaves out of shrubbery beds and cut back to the ground the freeze-damaged foliage of perennials (such as hosta, daisies, elephant ears, banana trees, perennial hibiscus, salvia, Echinacea, daylilies, agapanthus, etc.). Do not prune shrubs at this time. Since most hydrangeas look dead at this point, many people make the mistake of cutting them back. Don’t do it! Also, we recommend that you do not cut back the dead limbs of lantana, angel trumpets and confederate rose until they begin to put out new growth in the spring. To keep your pansies blooming, they need fertilizer and lots of sun. Deadheading helps but is not essential. Fertilize your pansies regularly with a fertilizer high in phosphate. 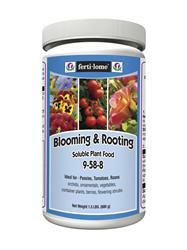 We carry Fertilome Blooming & Rooting Soluble Plant Food, which you just dissolve into the water you give your pansies. Shrubs and trees still need water in the winter, but not as much. They will actually fare better through a severe cold spell if they are well hydrated. So if we go through a dry spell, take advantage of some of our warmer days to water your plants.